Just two days after the Natural Resources Defense Council (NRDC) and other anti-fracking groups “marched for science” as part of Earth Day, an NRDC-funded study has added to the already long list of scientific evidence that fracking is not a major threat to drinking water. This is just one of numerous peer-reviewed studies to confirm fracking is not a significant threat drinking water (see full list below). And like a 2015 University of Cincinnati study that also found the fracking process did not contaminate drinking water, this report is all-the-more notable considering it was conducted, in part, by anti-fracking researchers. Study co-author Robert Jackson, a Stanford University professor, and Vengosh were both behind previous deeply flawed Duke studies that purported to find widespread contamination from shale development, and Vengosh has produced a number of anti-fracking studies over the years. Fortunately, unlike the UC study, this study has actually been published. And like the UC study, the results were simply too irrefutable for the authors’ bias to affect the topline conclusion. One reason for the latter is that the study’s methodology included the use state-of-the-art isotopic tracers to determine whether or not detected salinity, trace metals and hydrocarbons such as methane were from the fracking process. The study also included water samples from 112 drinking water wells and baseline sampling from 20 wells. 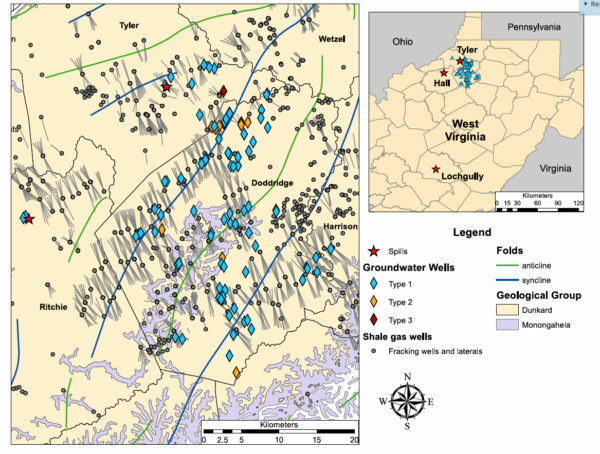 By incorporating the latter baseline sampling, the researchers were able to take into account water issues that pre-date recent West Virginia shale development that has led to more than 3,000 unconventional wells being drilled in the state. “The tests showed that methane and saline groundwater were present in both the pre-drilling and post-drilling well water samples, but that they had a chemistry that was subtly but distinctly different from the isotopic fingerprints of methane and salts contained in fracking fluids and shale gas. This indicated that they occurred naturally in the region’s shallow aquifers and were not the result of the recent shale gas operations. “The integrated geochemical data indicate that the saline groundwater originated via naturally occurring processes, presumably from the migration of deeper methane-rich brines that have interacted extensively with coal lithologies. These observations were consistent with the lack of changes in water quality observed in drinking-water wells following the installation of nearby shale-gas wells. With regard to surface water impacts, the authors were only able to conclude that spills “may” pose a contamination threat, based on the fact that there was evidence of three spills impacting water in a study area that includes hundreds of shale wells, as the following graphic from the report illustrates. Unfortunately, at least one media report chose to focus on the three spills — two of which were injection well related and not exclusive to fracking — rather than the topline conclusion that there was no evidence of impacts from the fracking process. Environmental Protection Agency (EPA), 2016 (study link/EID blog). Along with the the recent overturning of a multi-million dollar nuisance verdict in Dimock, Pa., this study represents just the latest nail in the coffin of the anti-fracking movement’s debunked go-to talking point that fracking is an inherent threat to drinking water.